Highland Numeracy Blog | Making sense of maths…. I’m really excited to have finally launched the Highland Numeracy and Maths YouTube Channel. There is just one video on it at the moment but hopefully over time it will be populated with lots more including ideas for games (like the video below) and ideas for teaching concepts that are sometimes classed as ‘hard to teach’ or ‘hard to learn’. The video clip below introduces a game for addition and subtraction using Numicon. If you don’t have Numicon you could also play this with Cuisenaire rods and a number line that increases in centimetres. – Easier – For example just play to/from 10. – Harder – You could rename the 10s as 1s and play this as a decimal game. The Numicon 10 shape becomes 1 instead of 10 and each part of it is worth 0.1 therefore the 7 shape is worth 0.7 etc. – Even harder – You could also play this by subtracting below zero and work on negative numbers. The video shows two pupils being taught how to play the game in both its addition form (Race to Thirty) and then we switch to the subtraction form (Race to Zero). This could easily be taught to a larger group of pupils in a class and makes a great, purposeful independent activity. If you have any video requests for example games that target a specific area or an area that you’ve been struggling to get an individual, group or class to understand, let me know and I’ll add it to the list to be made. Any constructive feedback on the video (too long, too short, just right, too much commentary etc.) would be greatly received. The Scottish Mathematical Council Conference is a popular conference held each year. This year, for the first time, there will be an event held specifically in the North of Scotland and for those in Inverness, it’s right here at Millburn Academy. There are a wide range of presenters from all over Scotland with content aimed at both primary and secondary so there will definitely be several workshops that will interest you. The day will run from 10am – 2.45pm. Click on the image below to view the Conference Overview and Workshop Programme. Tickets cost £20 and are available from Eventbrite. I hope to see lots of you there for a great day of CPD. 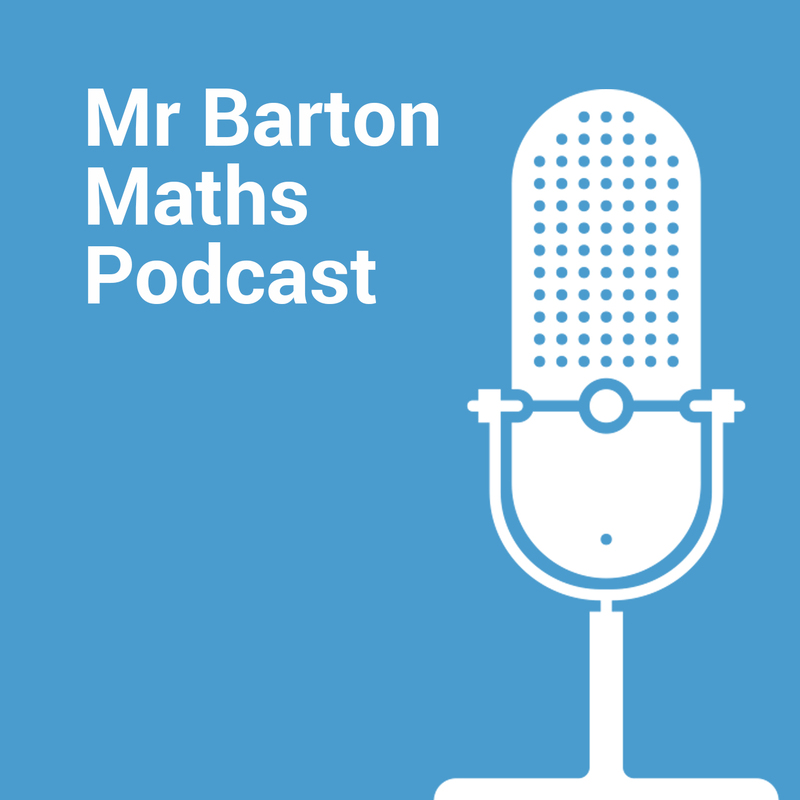 Most weeks I have to travel quite long distances working with different schools across Highland and thankfully I came across the Mr Barton Maths Podcast so I can use the hours in the car really productively and get some really valuable CPD as I go. The podcasts are typically about 2 hours long and Craig (the presenter) has a wide range of guests from maths teachers, researchers and specialists with specific areas of interest or working with specific age ranges. People he’s interviewed that you may have heard of include Dylan Williams and Dan Meyer to name just two. The interviews are packed full of useful information to help inform your teaching and there are always lots of research articles that are discussed and linked to as well as useful websites to visit. The last one I listened to was an interview with Alex Quigley called ‘Closing the Vocabulary Gap’. This was really relevant to something I’m working on at the moment to do with language and maths and will also have useful crossovers between literacy and numeracy as well as other subjects. I don’t agree with all the ideas presented but that’s the great thing about it – that a wide range of views and approaches are presented so it gives you an opportunity to hear alternatives and question your own thinking, values and beliefs. I can highly recommend everyone getting involved and listening to these whenever they can. I stand by the fact that it is better for pupils to be able to use and manipulate concrete materials themselves (as opposed to just seeing/using digital versions of these) however the digital versions are handy particularly when you’re trying to show something to a whole class or a large group and you want them to be able to see it more clearly. A student teacher recently showed me the Mathsbot website – I’ve no idea how I hadn’t come across it before as it’s full of the things I love! It has even more digital manipulatives than sites I’ve shared before and also has increased versatility for some of them as well. For example, with the ‘Dienes Blocks’ it has an exchange button so if you have a ‘ten’ for example, by clicking ‘exchange’ pupils can visually see the ‘one ten’ being exchanged for ‘ten ones’ – this is supported by colour coding and you can also separate them out afterwards too. If you have any ‘go to’ websites and want to share them with others – drop me an email with a review of the site including how and why you use it with your pupils. I’m always keen to evaluate the things I and others are using so would welcome a discussion on pros and cons of any of these things and whether they are just gimmicks, fun things that kids enjoy doing and/or whether they truly enhance pupil understanding and experiences. The Enterprising Mathematics Challenge took place for the first time in Highland in 2017, and we are delighted to offer this exciting challenge for primary schools for the third year running. The event will take place on Tuesday 23rd April 2019 at Dingwall Academy, in conjunction with the University of Aberdeen and University of the Highlands and Islands and will be open to Primary 6 and Primary 7 pupils. Each school can enter a team of three pupils with an accompanying teacher/adult. A team should consist of at least one boy and one girl from either Primary 6 or Primary 7, although for smaller schools consideration will be given for pupils in Primary 5 to enter too. Whilst there will be an element of competition between schools, the emphasis of the day will be on working together, mathematical thinking, skills and enjoyment. All participants and their schools will receive certificates of participation. The Highland Enterprising Mathematics Challenge trophy will be awarded to the overall winners. Finally, for the poster competition there will be a prize for 1st place (all schools). As demand was very high last year, places will be limited, and will be allocated on a first come, first served basis. If you would like to enter a team for this event please email sarah.leakey@highland.gov.uk by Friday 1st March 2019. There are a few upcoming CPD courses that people may be interested in if you don’t already know about them. This course will be a useful introduction to anyone who has not had training using the diagnostic assessments or the Highland Numeracy Progression. It would also be useful for individuals who are new to schools who have already received a lot of training and they have not had the opportunity themselves. Understanding the ‘Teaching Model’ to support conceptual understanding. Hands on ideas to support teaching at Early, First and Second Level. Both courses (Early/First and First/Second) were originally put out to probationers but would be relevant to any staff who want more CPD in these areas. There are still spaces on both courses so they are being opened up to staff other than probationers. Ideas involving a range of concrete materials will be covered so there will be options for all regardless of the concrete materials your school has. Concrete materials include: cubes, counters, tens frames, straws, Dienes equipment, Cuisenaire rods, Numicon, Decimats, animal strips, fraction towers, Rekenreks, abacus etc. Ideas for using digital versions of these hands on materials will also be shared. Choice of material based on targeted strategy and number range will be explored. The cut off date on the CPD calendar is today for the course on 12th February but there are still spaces so if you wish to sign up after the cut off date, that will be fine.